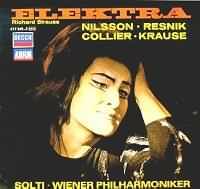 Decca has recently reissued a number of analogue Solti opera recordings with the benefit of refurbished sound obtained by remastering with a 96kHz 24-bit Genex recorder and the CEDAR DH2 de-hisser. 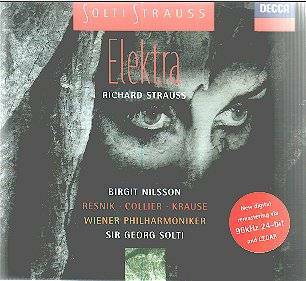 I have been able to compare the two Ring cycles and have now been listening to Elektra. I am grateful to Marjorie Williamson for lending me copies of the original CDs (complete with booklet autographed by Birgit Nilsson). I will answer the obvious questions immediately. Is the sound an improvement? - Yes it is. There is a small but real difference. Should you replace your original CDs with this new issue? No there is little need, particularly as Decca have made the utterly reprehensible decision to re-release at premium price thus cutting off a large portion of their potential market.. In side by side comparison there are discernible improvements but I have to admit that this wonderful Strauss score so captivated me that I often found I had forgotten which version I was listening to. At reasonably high playback levels there is little discernible hiss on the original issue so the Cedar DH2 de-hisser did not have much de-hissing to do. Disc one of the new issue is cut at a slightly lower level than the original whilsy disc 2 is slightly louder which made the job of comparison more difficult. Your money buys you new packaging (although I have an affection for the old Salome and Elektra LP covers), the original booklet printed on better quality paper and a new booklet of photographs and including a couple of essays: Michael Kennedy on 'Strauss and Solti' and James Lock on 'Recording the Strauss operas with Solti'. It looks as if this booklet might be common to the series and from it we learn that Elektra was a four track recording using the Culshaw grid on the sound-stage, and that these four track recordings were used for this re-release but were not used for the original CD release which was developed from the stereo master tape. That is where the improvements lie. As I have said, there is a small but real difference and improvement in the sound; my difficulty is in describing it to you. The re-issue has a more dispersed sound, both tonally and spatially, and the voices give a better impression of coming from a stage. This makes the component parts more distinct and easily discerned and the whole listening experience is a more relaxed one. The original issue opens by throwing the sound image in your face like an uncomfortable splash of cold water full of ice chunks from which you immediately recoil. The re-issue has greater depth, the bass drum and lower strings are more clearly defined and the effect Strauss wanted to achieve more easily discerned. Instead of recoiling from the sound recording you now recoil in horror from the effect Strauss produces (this is not a pretty opera)! The orchestra plays in a more three-dimensional space with a more believable depth of sound stage, try the quieter passage from 5.48' onwards. Strings and woodwind are beautifully balanced, the new distance lending enchantment, but the chugging basses at the start of track 2 still exert their powerful effect as Elektra appears before us. The buzzy, edgy halo that is a feature of Nilsson's voice has also been rendered less intrusive without any loss in the power of her projection. In the first meeting of Elektra and Klytämnestra one is again aware of a slight widening of the soundstage with increased openness, each voice has greater separation and projects with improved clarity. But again I must stress that although I am using adjectives such as 'greater', the overall change really is slight, but it is an advance and shows how good the original DECCA recordings were. We knew that, of course, from Das Rhinegold which is absolutely amazing for its age! Orestes is Dead! I played this scene with Chrysothemis and Elektra several times because I found so little difference between the two transfers at this point. I had hoped the separation between the two voices might have been increased. In a blind testing I suspect I would find it very difficult to distinguish one transfer from another at this point, the earlier transfer being distinguished only by a slight tunnelling of the sound. When Tom Krause enters (track 6) there are one or two silent passages (rare in this opera) where the improvement in residual noise can be noticed in the re-issue and again, the slight spreading of the sound is more realistic with less 'spitting' to the treble. In the original transfer both voices become a little hectoring in the scene that follows and, to some extent, this is smoothed out in the re-issue. Should you have the opportunity to compare these transfers my recommendation would be to try track 11 on disc 2. Here you can appreciate the solidity of the basses (never to be matched in the opera house I suspect) and the total silence surrounding them. Tape hiss audible in the original here has been completely removed. Equipment used: Aiwa XC750 CD player fed directly into a Quad 405 power amp. KEF Reference 104/2 speakers.